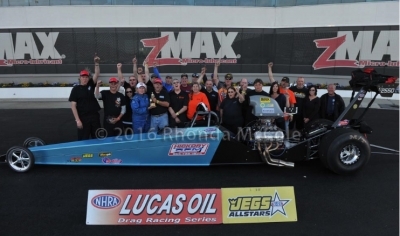 IN ONLY HER SECOND FINAL ROUND IN TD ANGELA WINS THE WALLY IN HER NEW 2016 MILLER TOP DRAGSTER AT THE DIVISION 2 CHARLOTTE RACE. OUR CONGRATS GO OUT TO HER. Angela Travis' MOV: 0.0003 seconds (approximately 1 inch) to collect her first divisional Wally in her second-ever Top Dragster final round.